His nest was located on a windowsill in the basement of an old, old spaceship. All the ship’s garbage fell into the basement through trap doors in the ceiling. Gary spent his days flying over the garbage piles, searching for scraps of food and interesting pieces of junk. He was always careful to avoid the vulture beetles that ate everything (including metal) in order to make room for more garbage. You’ve been reading an excerpt from The Quality of Life in Outer Space, available on Amazon. Gary is an eagle with a human head. He takes off on a journey to the top floor of the spaceship and struggles to warn the crew about the oncoming asteroid. He learns some shocking secrets along the way. The book is aimed at younger readers, but adults would get a laugh out of it too. The paperback is $5 plus shipping and handling. The Kindle edition is $1.99. You can click here to order. I started writing when I was twelve and never stopped. Now I work in a factory, driving a rickety old forklift, but I still write books in my free time. I self-publish them on Amazon too. Writing is more than a hobby for me. It’s a basic need like food and water. I mostly write science fiction stories filled with dark, twisted humor. Sometimes I write madcap comedies set in the South. I also write a little bit of nonfiction. 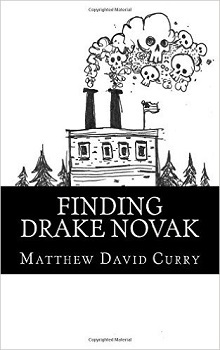 Finding Drake Novak combines science fiction and Southern Gothic. Drake Novak is a malevolent alien with bloodshot eyes and a black business suit. He draws his nourishment from the pain and sadness of other living things. He takes over a factory in rural Georgia and keeps all the workers as miserable as possible. He absorbs their frustration and despair the way a plant absorbs sunlight. Then a young policeman from the Galactic Precinct comes to Earth to arrest him. Under the Electric Sun is a book about a robotic raccoon and a boy named Jake. They live in a luxurious underground city beneath the ruins of Washington, DC. One afternoon, as they relax in a room full of plastic trees, a giant praying mantis arrives and tells them it’s safe to live on the surface again. Their lives change forever. I also love to draw. Sometimes, when people find out I’m an artist, they hound me to draw portraits of their kids. Or they describe tattoo ideas to me, asking me to draw all kinds of ridiculous, complicated things. Some people are downright rude and pushy about it. How to Make an Artist Miserable is a book about these annoying people and the ways I’ve learned to deal with them. All my books are available on Amazon. You can order paperback copies or download them to your Kindle. * You can also visit The Publishing Parlor, my other blog, to learn more about my books. It’s mostly a collection of book samples and a few personal essays. Feel free to visit, but please don’t follow it. If you follow that blog, your inbox will be flooded with posts. I update it compulsively. It will drive you absolutely nuts, I promise. We found an auditorium where a heavy metal band was playing. Thick smoke floated above our heads. Red laser beams flashed in the air. People danced with their eyes closed, waving their arms in slow motion, grasping at imaginary objects with their fingers. I watched them with nervous curiosity. After the show was over, I stumbled into the street with Greg and Jesse. It was time to return to the youth hostel. We walked down a staircase in the sidewalk, into the concrete labyrinth where the subway trains lived. We boarded a train and rode through the tunnel a few minutes. Then we stepped off and climbed another set of stairs. When we reached the top of the stairs and looked around, we didn’t recognize the signs and buildings around us. We had gotten off at the wrong stop. We didn’t know where we were. It was almost eleven o’clock. And we couldn’t call our teacher on our cell phones because we didn’t have cell phones. It was 1998. So we rambled through the streets, asking strangers for directions to the youth hostel where we were staying. Most of them were friendly and polite, but they had never heard of the Jump In Youth Hostel. We even found a black taxi cab parked indiscreetly on the sidewalk, a common practice in Germany. The driver sat behind the wheel, sipping coffee and listening to the radio. We eagerly asked him to take us to the Jump In Youth Hostel, but he shook his head and started pointing, giving us directions in German. None of us understood German well enough to know what he was saying. We mumbled “danke” and walked away, disappointed and discouraged. We walked through the subway and found a group of policemen playing cards in a small, dirty room with pictures of naked women plastered on the walls. We explained our predicament to them. They also gave us helpful directions in German. You’ve been reading an excerpt from How to Make an Artist Miserable. The Kindle version is free May 19-23. The paperback version is $5 plus shipping and handling as always. Copyright 2015, 2017 Matthew David Curry. All rights reserved. I hate it when people stand behind me, staring down at my paper and invading my personal space. I don’t know how other artists work, but I spend a long time building the basic shape before I flesh out all the little details. If I’m sketching a face, I might spend ten minutes forming the outline of the head and the curves of the hair around it. But if spectators are gathered around me, I feel obligated to hurry up and work faster in order to keep them entertained. This hasty scrambling always leads to a sloppy picture. They don’t understand that I’m building the picture in layers. They just think I’m forgetting important details, so they like to point at the paper and remind me to add this and that. Sometimes, they’re deliberately being rude. Sometimes, they’re truly ignorant. Whatever their motivation, it drives me insane. If you don’t know what you’re talking about, don’t open your mouth and spew criticism. This is why I prefer to draw in the privacy of my apartment, spinning a Miles Davis record on my turntable. Or sitting in a cool hotel room, drinking coffee and listening to the soothing music of The Weather Channel. 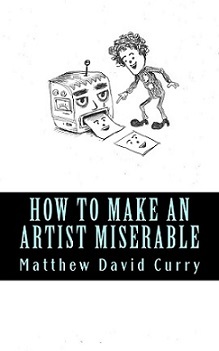 How to Make an Artist Miserable is free on Kindle May 19-23. The paperback version is still $5 plus shipping and handling.